I love to mix familiar pieces in new ways. And sometimes, I like to wear the same things, just as they are, and no one seems to notice (or at least not comment). This strategy makes getting dressed easier and more fun, than ever it was in my high-paying corporate years. The joys of retirement, and of authentic dressing. 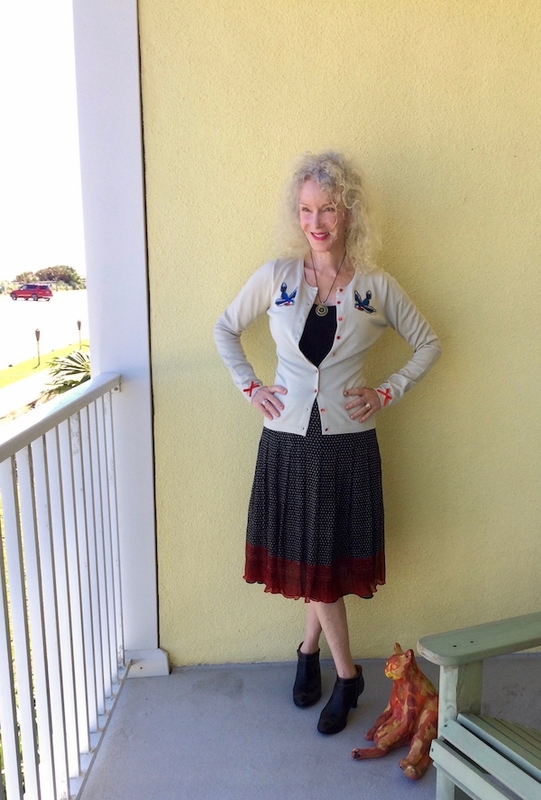 I’ve worn this birdie cardigan (similar) before; it always adds a spirit of whimsy and it’s soft and cozy. This is the first time I’ve paired it with a full midi skirt by Anne Klein (thrifted, sim). The booties (sim) are old as Methuselah but still comfortable. The pendant (sim) was thrifted for a dollar, and it’s reversible. Cannot beat that. Isn’t thrifting the very best? A black tank is all I need underneath, for Florida Fall. The skirt has deep red lace at the hem. My forefinger is still purple from the garage door incident. Now, let’s see what you’ve been wearing, Visible Women. Previous Article← Personal Style Formulas: What Are Yours? I LOVE that cardigan! Put an animal on anything and I’m a sucker for it! I completely agree with Tiina re constancy and continuity. This is something I’ve touched on in my linked post. Refinding gems in your wardrobe that you may have not worn for a while, being inventive with pairing existing pieces, getting your wardrobe to work smarter not harder. Great style, as you’ve shown here Patti, doesn’t require you to bust a budget! And why not wear that adorable cardigan again and again? I know I would. It’s absolutely darling. 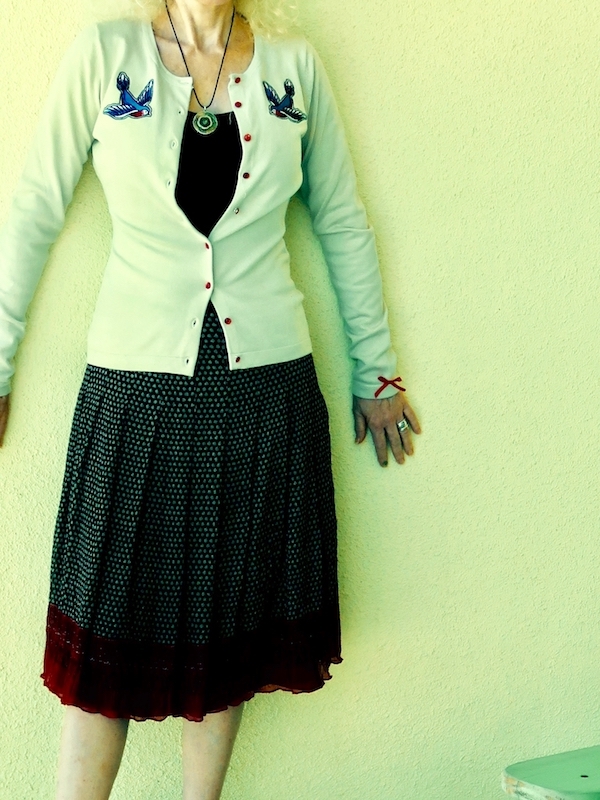 I remember this sweet birdie cardigan and love it paired with this pretty skirt. I am a great believer in clothing that earns its keep and repeat wear the same things often in different guises. Many thanks for hosting Visible Monday. You said it, there’s nothing like thrifting. I adore your bird sweater and the red lace hem skirt. I hope your finger fades to pink soon!! Thanks for the party – I can use one right now! Love the lace hem detail on your skirt! That cardigan is so pretty and looks cozy too! Adorable feminine outfit! Love the sweet birdies and little bows which go with your skirt. And what can be better than old favorite comfy booties? Thank you for the link-up, Patti! I think it is great to find pieces that we want to wear over and again. You find some great “finds” thrift shopping. Wish I coould stand for hours to do it! Love the birdy cardi, very figure flattering too. The skirt is lovely and geez I didnt know about hurting your finger! oww, take care.. I really like the print of your midi skirt and the mixture of red lace it offers. Great pairing with the adorable cardigan! Buying second hand is the only way to shop! Once you give yourself over to thrifting you will never go back. Love the details on this sweater! Gorgeous with the midi skirt. Looking pretty as always, Patti! Such a cute cardigan and I do love the red lace trim on the skirt! Hello dear patti, Thank you for another great party. What a lovely cardigan! Looks great with this skirt! Yes, to the joys of retirement and authentic dressing! I remember this lovely birdie cardi and I believe its found its mate in this skirt. Love that cardigan, Patti! Thanks for hosting! Yours is a lovely style. Thanks for sharing and hosting. Beautiful outfit & beautiful pieces! I can see them combined in so many different ways… It’s fun to get creative what you have in your closet. Thanks for the link up! Have a wonderful week! I do think it’s a fun challenge to take our old reliables and add in different elements! I have a reversible necklace and think it’s brilliant—they should all be that way!! Thanks for the link up, Patti1 Have a wonderful week! I love your cute little cardi, it’s definitely a keeper, it goes with anything.